There's no denying that Don Pendleton's 'The Executioner' (1969) was the catalyst for 70s and 80s men's action adventure fiction. The series went on to spawn hundreds of imitators with the majority fixed on the idea of “er” at the end. Thus, 'The Enforcer', 'The Butcher', 'The Punisher', 'The Avenger' brands are born. Other than one novel, the first 38 books are penned by Don Pendleton (the oddity was the 16th entry, William Crawford's “Sicilian Slaughter”). After legal battles with publisher Gold Eagle, and maybe just lack of ideas, Pendleton left the series in 1980 to focus on 'Joe Copp' and 'Ashton Ford' installments. 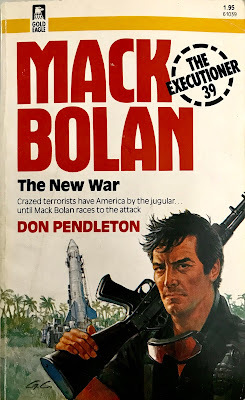 In turn, Gold Eagle continued on without Pendleton's pen, rebranding it as 'Mack Bolan' with entry number 39, “The New War”. Like all great bands, there comes a time when the act either calls it quits or simply evolves into the next lineup featuring the “replacement” singer. They've all done it – AC/DC, Journey, Judas Priest, Iron Maiden...it seems to be the rite of passage. 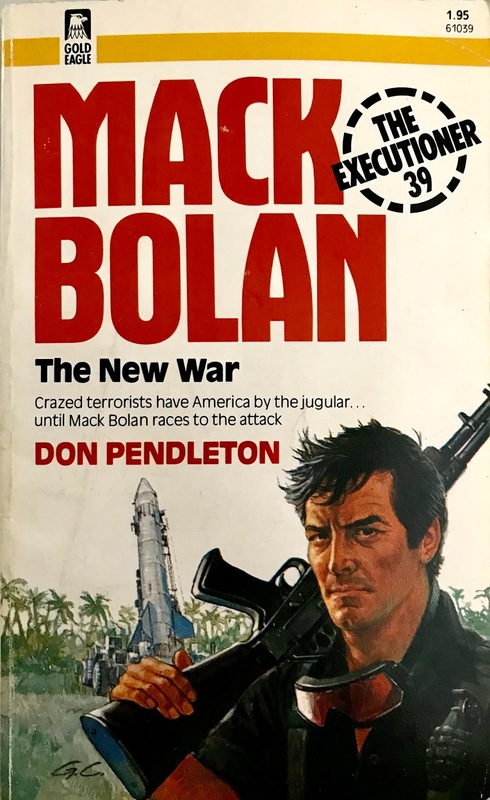 With 1981's “The New War”, Mack Bolan's life changes under new writers. The mission remains the same, but the methods vary drastically. Under writer Saul Wernick, familiar readers find Bolan fighting crazed terrorists in Central America – for the US government. Bolan, fugitive from justice, wanted by the F.B.I., C.I.A. and even a “Bolan Taskforce”, is now working for the US government. It would only make sense right? Can't beat them, join them. But it's the other way around here – the government is joining Bolan's fight. The book's opening pages is not only important to the direction of the series, but it also builds what we now consider the Bolan Universe – the series of “Able Team”, “Phoenix Force” and “Stony Man” gain a foundation here. 'The Executioner' series regulars like April Rose and Hal Brognola are now in charge as a directive of the C.I.A. (sort of). Specifically, Mack Bolan no longer exists, instead he has been created as John Macklin Phoenix, a retired Colonel. The entire Phoenix Program is now a covert operation running out of a Virginia farm called Stony Man. It's officially a C.I.A. “quiet house” spread over 160 acres. Behind the curtain are plenty of familiar Mack Bolan allies. Carl Lyons, Hermann “Gadgets” Schwarz and Rosario “Pol” Blancanales are at Stony Man. These three would later collaborate as Able Team (series debut in 1982). Other Stony Man players are here as well, including Jack Grimaldi and Leo Turrin, both supporting characters as far back as single-digit entries in The Executioner. Billed as “Stony People”, they are mostly just spectators in “The New War”. Bolan's mission is to locate an American secret agent named Laconia. He's been captured by Islamic terrorists and imprisoned on a jungle base between Colombia and Panama. After days of intense torture he's hovering between worlds and the rush is on for Bolan to capture or kill him. Bolan, understanding the sense of urgency, is battling overwhelming forces and a looming hurricane that could play havoc for any air support. First and foremost, Saul Wernick isn't a remarkable writer. While average at best, his prose contains plenty of exclamation marks that were outdated and unnecessary even for 1981. Pulpy hyperbole isn't typical for a Bolan novel, thus Wernick's writing style alienates fans and creates even more abrasion. However, I'm probably committing an act of treason when I say that I want Bolan fighting internationally. I prefer Bolan vs Armed Terrorist more than any mafia war. I love Pendleton, but after more than 10 novels of Mack vs Mob...I needed some liberation. “The New War” introduces a lot of interesting ideas and expands the vigilante idea into a robust and entertaining concept. Even though this novel isn't written with a distinct literary prose, it's a much-needed new Bolan that introduces me to the Stony Man universe. From here, one can use “The New War” as an “origin” story. A simple reboot for a new generation of fans. I'm one of them.